From January 24 onwards, the Nespresso on Ice Truck is hitting the streets of Joburg and Cape Town to serve up a sip of something special this summer. 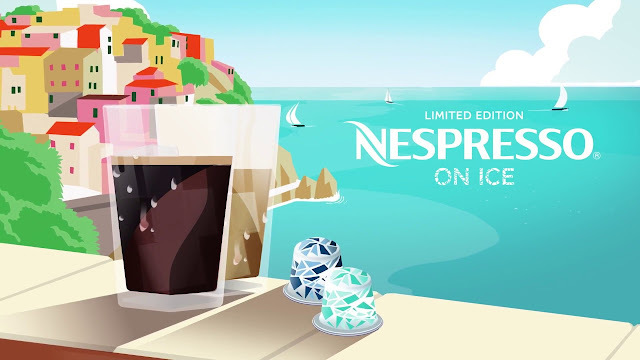 Following the launch of two Limited Edition coffees that have been specially crafted for iced coffee preparation, the Nespresso on Ice truck will be cooling down the city’s hot spots by delivering delicious iced coffee. What better way to enjoy a moment of perfect refreshment in the height of summer? Intenso on Ice and Leggero on Ice are the first coffees Nespresso has crafted specifically to be enjoyed as iced coffees. Intenso on Ice is a bold coffee with cereal and cocoa notes and an intense, roasted finish. If prepared as an Intenso on Ice Macchiato, it reveals a smooth and creamy texture with biscuit notes. In contrast, when enjoyed as a black iced coffee, Leggero on Ice offers delicate fruity and lemon notes with lingering aromatics and a full-bodied, smooth texture. If paired with milk to create a Leggero on IceMacchiato, it develops toasted notes and a more milky and sweet flavor. STEP 3 Finish with 90 ml of cold water or cold milk froth (approx. 6 tablespoons) Voila! Intenso on Ice and Leggero on Ice will be available for a limited period from Nespresso booths and boutiques nationwide, as well as through orders from the Nespresso Club on 0800 637773 and online at www.nespresso.com from 15 January 2018. Nestlé Nespresso SA is the pioneer and reference for highest-quality portioned premium coffee. Headquartered in Lausanne, Switzerland, Nespresso operates in almost 60 countries and has more than 9,500 employees. In 2013, it operated a global retail network of over 320 exclusive boutiques. For more information, visit the Nestlé Nespresso corporate website: www.nestle-nespresso.com. You can now recycle your used Nespresso capsules. Nespresso Club Members and South African coffee lovers will now be able to easily return their used Nespresso capsules for recycling at the Nespresso Boutiques in Cape Town at the V & A Waterfront and in the Canal Walk Shopping Centre and in Johannesburg in Sandton City and Hyde Park Shopping Centre. In line with the company’s global approach, Nespresso has implemented a dedicated recycling system, tailored to the recycling processes and logistics in South Africa where Nespresso used capsules cannot be recycled via traditional waste collection and recycling systems. Once collected, used Nespresso capsules will be recycled by Oricol, a fully-integrated and highly certified environmental service company that has assumed a leading role in South Africa for the delivery of superior environmental and resource recovery solutions.